Erika has taken young daughter Alice to her father's apartment to retrieve a forgotten toy. When the elevator suddenly stops on a particular floor, Alice slips out and immediately disappears. It has happened suddenly and now Alice is nowhere to be found. The timing is especially devastating to Erika as it was her plan that this would be Alice's last time seeing her father. Erika had lived in an emotionally abusive marriage and left her husband Michael six months after Alice was born. Things have not gone well over the past several years and now Erika no longer wants Michael to have visitation with Alice. The question Erika is grappling with is whether Alice is lost or has Michael had a hand in actually kidnapping her? Erika experiences a maelstrom of emotions while searching for Alice, especially as the story vacillates between then and now. The Day I Lost You is utterly thrilling. I read with eager anticipation as Erika feverishly searched for her daughter. And, wow! There were surprising twists, but it was the ending that offered a truly shocking conclusion. It was completely unexpected. 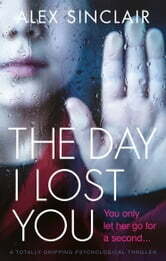 This was a true psychological thriller that kept me on my toes. Alex Sinclair is an author that I will certainly watch out for. Many thanks to Bookouture and to NetGalley for this ARC to review in exchange for my honest opinion. Well.. that was unexpected! I certainly did not see that ending coming.. and I loved it. I had so many scenarios going on in my head but none of them were right - what a great book. Erika takes her 4 year old daughter Alice to her ex husbands apartment to pick up a toy that had been left behind. Ion the way up to the top floor the elevator stops unexpectedly and Alice runs out before her mum can catch her. This is the story of Erika trying to find her daughter. It also jumps back to when Erika and Michael were still married, before Alice was born. It is an absolute page turner, a very fast read that you won't want to put down. Found this book long drawn out kept skipping pages especialy when a child goes missing & no police called bit dissapointed after reading good reviews.